He’s finally here! 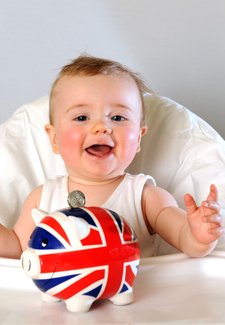 Prince George Alexander Louis of Cambridge will bring joy to the whole nation, and luckily William and Kate won’t have to worry about the costs of bringing him up. But having a new baby can be an expensive business. 1) Make sure you open your Bounty bag Every new mum will be given a free Newborn Pack from parenting club Bounty while they are in hospital. In it, you’ll find lots of advice and tips on claiming any benefits you’re entitled to, money-off coupons and free samples such as baby wipes, nappies and nappy cream. If you don’t receive your free pack, click here (http://www.bounty.com) and sign up. 2. Host a hand-me-down party Rather than a baby shower, where you may get lots of lovely, but unnecessary, toys and clothes, throw a hand-me-down party and ask guests to bring any unwanted baby gear instead. You may get lots of useful clothes, equipment and toys, and your friends will be pleased to see their much loved items going to a good home. 3) Get baby items for nothing Websites such as Freecycle (http://uk.freecycle.org) and Freegle (http://www.ilovefreegle.org) are great places for picking up unwanted but perfectly useable baby equipment and clothes. If you’re not already a member, sign up, make sure you give a few of your unwanted items away first, and then just reply to any local listing you’re interested in, and hopefully you can pick up some useful bits for the baby for absolutely nothing. 4) Take free advice There are a lot of fantastic charities and groups out there who are on hand to give invaluable free help and advice to new mums. The NCT (National Childbirth Trust) (http://www.nct.org.uk) is the UK’s largest charity for parents, and its free helpline – 0300 330 0700 – can give you practical and emotional support in pregnancy, birth and early parenthood. If you’re planning to breastfeed, The National Breastfeeding Helpline, funded by the Department of Health – 0300 100 0212 – is great for practical info and support for any breastfeeding queries. And if you’re a single parent, the charity Gingerbread (http://www.gingerbread.org.uk) has a freephone helpline on 0808 802 0925 to give single parents in England and Wales one-to-one confidential advice and info. There are also over 3,000 Sure Start children’s centres in England, open to all parents, carers and kids under five. They offer a range of free services, including advice on breastfeeding and parenting support. Many also have great free play areas and other activities for little ones. Find one near you by clicking here (https://www.gov.uk/find-sure-start-childrens-centre). 5). Join online shopping clubs Three of the top supermarkets have baby clubs which send free samples and money-off baby product vouchers to new members. To join, simply click on your supermarket of choice: Tesco (http://www.tesco.com/babyclub/); Asda (http://your.asda.com/baby-club/); or Sainsbury’s (http://www3.sainsburys.co.uk/littleones/). Boots also has a parenting club (http://www.boots.com/en/Mother-Baby/Parenting-Club/) you can join that will give you access to offers and magazines aimed at your child’s age, plus a coupon to activate earning 10 Advantage points for every £1 you spend on baby items.